Kicker Qi21 2-channel Rca Audi..
K-Grip features heavy-duty, proprietary machined metal ends with rubber grips. K-Grip line union is ultra-slim for snag-free cable routing in tight places. The cable also features wire-loom jacket over silver-tinned OFC foil shield which protects wire. The hyper-flex technology allows the wire to bend twist or contort in any way possible. 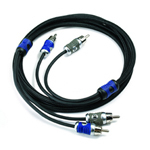 QI21 Features: Product # QI21, Interconnect Cable, Cable Length : 3.26ft, 2-Channel Q-Series Signal Cables, Dual Twisted-Pair Conductors - To Eliminate Inducted Noise & Interference, Hyper-Flex Technology, Black Protected Mesh w/ Wire Loom Jacket, Ultra-Slim K-grip Line Union - Provides Snag-Free Cable Routing In Tight Places, Large K-Cut Collars, Integrated AR Foil Shield, Split Center Pin, Heavy Duty Proprietary-Machined Metal Ends, Silver Tinned OFC Wire"